Kenya Airways plane at JKIA. Thirty-three people were injured when a vehicle that was ferrying Kenya Airways passengers from JKIA after their flight was rescheduled was involved in an accident on Mombasa Road Monday morning. The airline said the accident happened at around 2am on Monday. "The van was hit from behind by a trailer throwing it off the road, injuring a total of 33 passengers," said the airline. "The passengers were scheduled to leave for Bangkok, Thailand, last night but due to a technical problem on the scheduled aircraft, the flight was rescheduled, prompting the airline to accommodate the guests at a hotel." 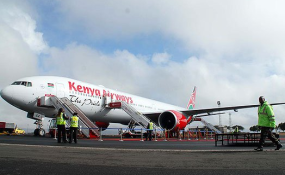 KQ further said the injured passengers were being treated at various hospitals in Nairobi. This also includes the driver of the van. Police have launched a manhunt for the driver of the truck, who did not stop following the accident.